Waterjet - Laurens Tool Inc. Many industries can benefit from the accuracy and variety of materials provided by the cutting capabilities of our Waterjet. We can hold a tolerance of somewhere between ± 0.001"depending on material conditions and required tolerance of the part. If tight tolerances are not a significant factor on your project, a few thousandths of an inch are okay to spare in order to save time by running the part faster; when precision is the key factor, slower speeds are essential to a quality product. Waterjet cutting provides us with the capability to cut a wide variety of materials, including thick metal alloys, glass, plastic, wood and more. It also provides precision, accuracy and versatility. And with our Taper Control head, it maximizes consistency while reducing taper. 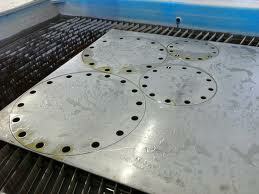 Waterjet cutting is among the most precise metal fabricating processes in existence. The main advantages of waterjet cutting are the variety of materials and the thicknesses which can be cut. An abrasive waterjet can cut realistically a 4"- 6" thick piece of metal with very little taper. Materials, including glass, plastic, alloys, cardboard, foil, tile, stone etc., can also be cut into almost any 2D form imaginable. Another advantage is that heat is not introduced into the process. When it is critical to keep the molecular structure of your part intact, waterjet cutting is the right choice, as the water doesn't change any of the properties; it simply erodes the material away. 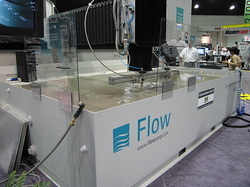 Because the nature of the cutting stream can be easily modified, the waterjet can be used in nearly every industry. 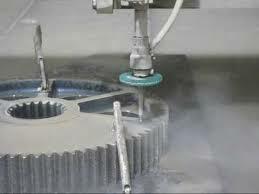 Some materials have unique characteristics that require special attention when cutting, and these unique characteristics have to be taken into consideration with each job processed.